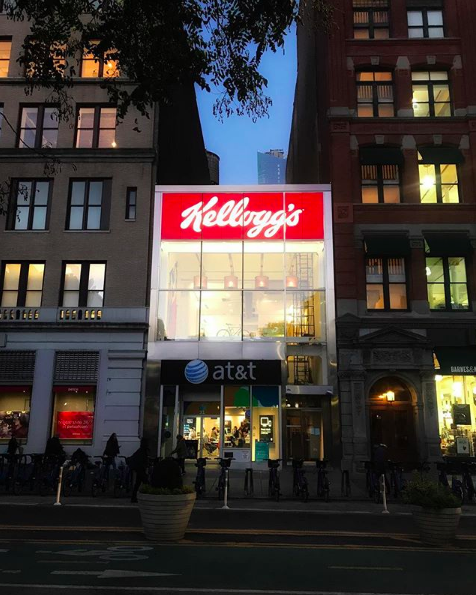 Bloomberg – "Kellogg Is Going All In on Cereal Cafes"
“We want cereal to be seen as modern,” said Aleta Chase, a marketing executive at the Battle Creek, Michigan-based company. "Kellogg has argued that cereal declines are easing as younger customers embrace it as an all-hours snack. But the turnaround has been elusive, and the cafe in Union Square is an attempt to generate some foodie buzz. In fact, it was the slew of pictures posted by visitors to the Times Square location that helped convince the company it needed a bigger space. “We needed something that was more experiential,” Chase said. “There’s a more lasting emotional connection if they experience it firsthand -- that’s hard to do with a TV commercial.”"
Wall Street Journal – "Kellogg Aims to Give Cereal Snap, Crackle, Pop Beyond Breakfast"